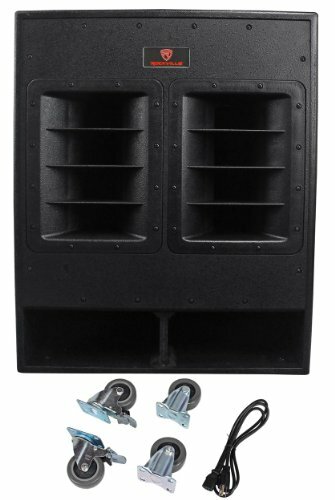 Rockville RBG18FA 18" 3000W Pro Audio Folded Horn Active Powered Subwoofer. 750 Watts RMS / 1500 Watts Program / 3000 Watts Peak. 18" Woofer with 130oz Magnet and 4" Voice Coil. Frequency Response: (+/-3dB) 25Hz - 120Hz. Maximum SPL @ 1w / 1m: 135dB Peak / 129dB Continuous. Power-On and Signal Input LED Indicators. Signal Input LED Indicator. Clip Limiter Circuitry with LED Indicator. Computerized Diagnostic Circuit with LED Indicator. Balanced XLR + TRS input jacks. Balanced XLR thru/output jacks for parallel connections. Passive heat sink with heat sensitive variable speed auto turn-on fan for cooling. Subwoofer Crossover 50Hz-250Hz Low Pass. Subwoofer Level Adjustment. Subwoofer Phase Control. Built-in XLR Balanced High pass Preamp Output @ 120Hz. Ground Lift switch for ground-loop noise control. Built-in pole mount socket. Built-in carrying handles. Heavy-duty 3" locking caster wheels. High density MDF construction. Dimensions: 35.4" x 28.7" x 29.1". Weight: 130Lbs.